Is it just me, or does Star Trek Into Darkness need no apologies? Like Han Solo apologising for the Greedo-hued mess in Star Wars, only more so, J.J. Abrams and Damon Lindelof sported sheepish ‘sorry’ faces in recent months. “That was a mistake,” groveled Lindelof over keeping the Khan reveal such a secret in Star Trek Into Darkness. “I’ll cop to that,” mumbled Abrams guiltily, doing his own Enterprise deck-clearing when accused of flooding his sequel with Wrath of Khan references. Hold those retractions. Into Darkness became something of a fan-rage totem after Trekkers at a convention voted it the worst Trek film. Not philosophical, they frowned. Too funny, they fumed, as if vintage Trek brooked no chuckles. But ’60s Trek was smart and fun: and Into Darkness re-energised its spirit with polish, propulsion, and élan. Sure, it’s not flawless. Alice Eve’s near-strip was hardly any more progressive than the ’60s episode – a thinking fans’ fave! – where Kirk KOs a woman in a foil bikini. The thudding title missed vintage Trek’s literary touch too, but other charges fired at Abrams are wide of the mark. “It’s not Trek,” seethed doubters, attacking Kirk's (Chris Pine) violation of the Prime Directive. Putting aside the point that Kirk’s deviation hardly goes unmentioned – it kick-starts the whole plot - Into Darkness does something cannier than its critics allow. What it does is stage a stand-off between ’60s Trek’s era-specific utopian optimism and nu-Trek’s troubled (the Federation tarnished) yet equally era-specific mindset. Old Trek’s idealism is worth aspiring to, it suggests, but it needs to be hard-won to wash with modern audiences. “It’s too much like Wrath of Khan,” carped other critics, a point Abrams conceded before showing how much he really cared by stuffing The Force Awakens to the gungans with A New Hope nods. But Into Darkness homages 1967 Khan episode Space Seed more than Wrath. Besides, Abrams’ most overt echo/flip of Wrath (Kirk’s sacrifice, Spock’s rage) fits his film’s thematic thrusts like a space tunic: the near-death experience extends both Kirk ’n’ Spock’s logic/humanity tussles and subtexts relating to the value of retaliation. As Pine and Zachary Quinto nail the emotions of the scene, we’re reminded how well Abrams casts and humanises spectacle cinema. 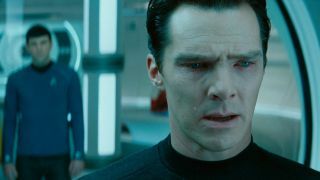 Benedict Cumberbatch’s contained menace slams the point home: never mind lens flares, watch those nostrils roar. And Khan’s controversial reveal? Yes, we sort of knew – but better a little playful secrecy than the usual pre-release info-drip. Sure, perhaps Abrams is overly wary of boring audiences: Into Darkness hurtles through its rug-pulls breathlessly. But it’s a refined popcorn rush, its direction delicious, its 3D deep. And so what if it doesn’t pause to pontificate? The better Trek films (including Wrath) tend to weave subtext into action too, unlike top-heavy flops such as Insurrection. Factor in a warm core of space romanticism and you’ve got a sincerely tendered Spock-buster alternative to the MCU’s quip carnivals and DC’s murky psychodramas. On these terms, no apologies were needed to clear the way to Episode 7. Besides revitalising Trek, Abrams’ Enterprise captaincy shares plenty of virtues with Han’s heartfelt homecoming. Or is it just me? Each month Total Film magazine argues a polarising movie opinion and gives you the opportunity to agree/disagree/tell us we’re mad. Let us know what you think about this one in the comments below and read on for more. Is it just me, or is Day of the Dead Romero's best zombie movie? Is it just me, or is The World's End the best of the Cornetto Trilogy? Is it just me, or are seething CGI baddies spoiling blockbusters?